One of the best things about Hanford has to be the riding. 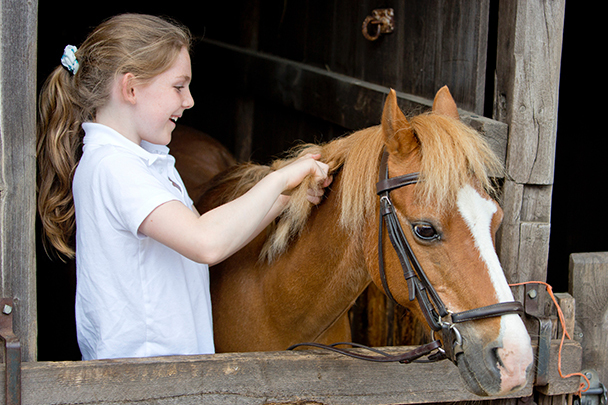 Riding lessons are timetabled during the week after lunch in games. The excitement amongst the girls at morning break, when the riding lists are put up, is palpable. Nervous chatter ripples down the corridor as they gather at the notice board to speculate which of their favourite ponies will be theirs for the afternoon. 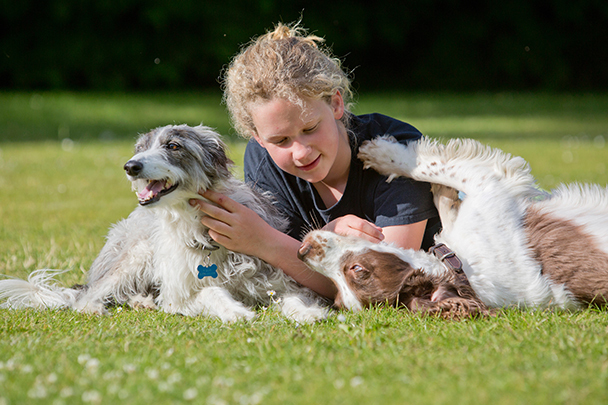 Whether your daughter is horse-mad or not there is something to charm everyone at the stables which are housed in a beautiful Grade II listed building. Chickens hop in and out and in the summer months the school’s various dogs lie basking in the sunshine outside the entrance. There are a selection of ponies of all shapes, sizes and scope. There is Guy, a beautiful piebald pony; Holly, a fiery chestnut; and Dandy, a sweet Welsh cross pony. Dinky, a Welsh Mountain pony, is one of the smallest but he is one of the most important. He is the pony the youngest girls learn to ride on; some will never have ridden before they meet him so it’s a big responsibility and one he takes very seriously. Dinky is a natural redhead with Celtic ancestry, so bad hair days are all too frequent. To avoid looking like the last of the Mohicans he patiently lets the girls brush and plait his mane and tail and in the summer months they weave daisies into his plaits. As well as all the riding, girls are encouraged go to the stables to groom and clean the ponies during their morning break. Here they will find the riding staff – Nigel, Eileen, Ruth, Amy and Charlie who will direct them. Nearly everybody rides at Hanford and there are many different standards and ponies to suit. There are different types of rides at Hanford, depending on the girl’s ability, the time of year and the weather. There are some wonderful hacks locally; the most popular ones have to be the rides up Hod Hill or the Early Morning Rides in the summer months. Hanford is also lucky to have its own indoor school with a qualified teacher who can work on the girls’ position, jumping and handling. 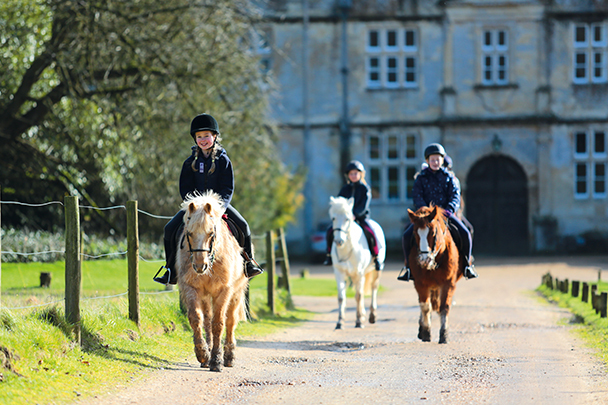 Beyond the riding school is a mini cross country course which offers the more experienced rider the opportunity to take on a challenge. During the summer term the girls ride out in the morning before breakfast. These “out” rides are on the hills, never the roads. This is probably one of the highlights of the year at Hanford. The Hanford chickens, who nest next door to the stables, are always up for some fun. 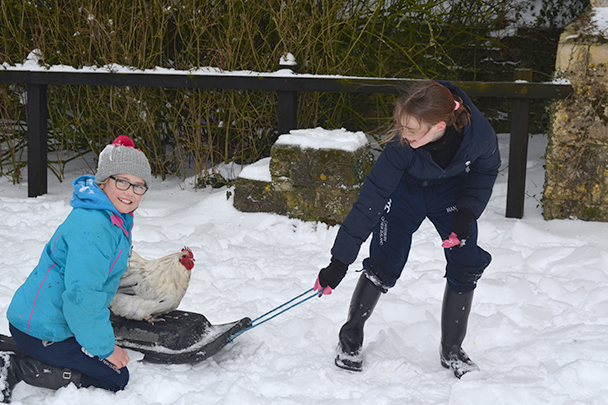 The girls like to dig up worms for them in the spring to snack on and in the winter months they have been known to take the odd sleigh ride to avoid getting cold feet. Hanford’s Chicken Committee is tasked with their care and wellbeing taking responsibility for naming, feeding and egg collection.